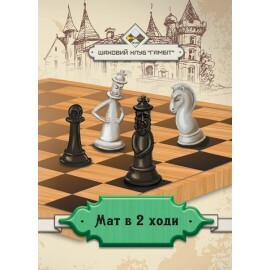 The book is «mate in two moves» published and used by the largest Ukrainian chess club «Gambit». It is intended for the development of combinatorial abilities, developed by a team of experienced chess trainers and practitioners, under the overall guidance of the honored coach of Ukraine R.A.Khaet..
Methodical training set of chess literature № 1. Set published and used by the largest Ukrainian chess club «Gambit». The unique development team of experienced chess trainers and practitioners, under the overall guidance of the coach of Ukraine R.A.Khaetsky. The course is designed to train from the beginner. Techniques feature in complete sync.. The book "Ukrainian Chess Tales"
Set published and used by the largest Ukrainian chess club «Gambit». The unique development team of experienced chess trainers and practitioners, under the overall guidance of the coach of Ukraine R.A. Khaetsky. The course is designed to teach children who are familiar with the rules of the game .. 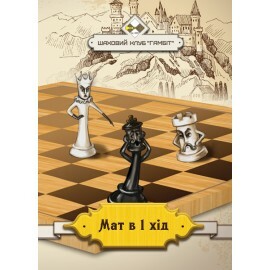 The book is published and used by the largest Ukrainian chess club «Gambit». The unique development team of experienced chess trainers and practitioners, under the overall guidance of the coach of Ukraine R.A.Khaetsky. The course is designed to train from scratch. techniques feature in complete s.. 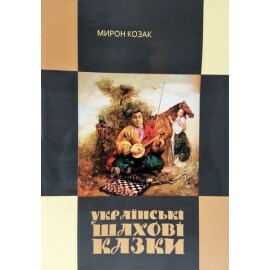 The book is published and used by the largest Ukrainian chess club «Gambit». The unique development team of experienced chess trainers and practitioners, under the overall guidance of the coach of Ukraine R.A.Khaetsky. The course is designed to teach children who are familiar with the rules of th..
«Workbook» is published and used by the largest Ukrainian chess club «Gambit». The unique development team of experienced chess trainers and practitioners, under the overall guidance of the coach of Ukraine R.A.Khaetsky. The material is intended for training and retention of knowledge from beginn..
«Workbook -2» is published and used by the largest Ukrainian chess club «Gambit». The unique development team of experienced chess trainers and practitioners, under the overall guidance of the coach of Ukraine R.A.Khaetsky. The material is intended for the education of children who are familiar w.. Addition to the «Workbook (Level 2)». The book is published and used by the largest Ukrainian chess club «Gambit». The unique development team of experienced chess trainers and practitioners, under the overall guidance of the coach of Ukraine R.A.Khaetsky. The material is intended for educational group leaders, allows to intensify th..